Grand Hotel, Dorning Street, not so grand now. Good shot, but why are these lovely buildings allowed to just rot away ? Worked there back in the 70's I was shocked when I saw what it's become. A grand picture never the less Chris......very bold in black and white.....always a fan of this type of photography......cheers!!! I used to go there on a Sunday night with my then girlfriend, in the mid 1960's. We always sat in the cocktail bar at the back. Thought I was a real toff <g> I remember they had a great selection of whiskeys, which I tried to work my way through, but time and money beat me.. When I was at the TLS probably 1961/62ish The French Rugby League side were staying there and me and my friend would go there every dinner time to talk to the players. I got really friendly with one player I think his name was Pierre Lacasse? One day the players were fooling about and threw a bucket of water out of a bedroom window and guess who it landed on!!!! I was soaked through They were really apologetic and gave me and my friend tickets for the next game.So it was worth a soaking L.O.L. 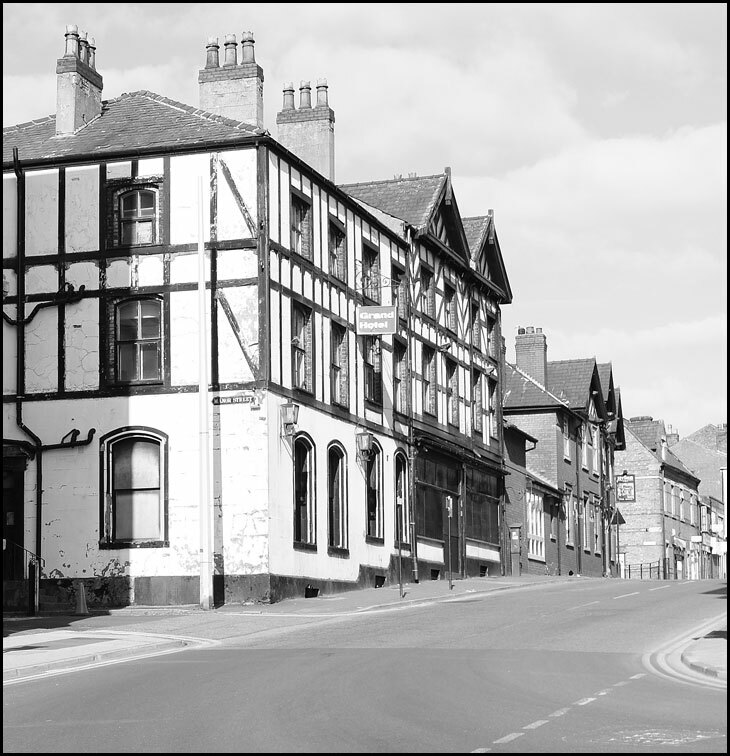 Not so many years ago this used to have a good restaurant and was one of the best places in wigan to eat out. Sad to see the place looking so forlorn. To me it was never that grand except for the name. I thought the Park hotel and the Clarence where far more grander buildings. Looks like it to far gone now and should be knocked down and replaces by a block of flats. It was a nice hotel in the 60s. Quite a contrast with the All Saints Tavern on the other corner. We had our wedding reception here in 1958.Good meal and excellent service from the staff. Best day of my life up to then. We had our Wedding Reception in the Grand Hotel, in August 1961. At that time, it was the best place in town for social drinking, meals, the Hotel to stay. Why do the council allow buildings in the town centre, to become another eye-sore, just like the bomb site at the bottom of King Street ??? I was wondering if anyone had any photos of this building before it was clad in it's mock tudor skin? was tragically killed in a plane crash.